Across the river we go for a test against the other sabre fencers in town. Things went well. Here are the OFA medalists and high finishers. Y10XS: Alex P, GOLD; Mukul S, SILVER. Y12WS: Sophia S, GOLD; Rayaana G, BRONZE. Y12MS: Hyder C, GOLD; Alex P, BRONZE. Y14WS: Byronie M, GOLD; Sophia P, BRONZE; Sophia S, BRONZE. Congratulations to all of our fine fencers. Your dedication and hard work pays off. Magda and Siobhan went Gold, Silver in the Cadet competition. Magda S. swept both the Cadet and Junior Gold medals at the SJCC in Anaheim, and OFA had a slew of other strong finishes at the new super regional competition. Siobhan earned Silver in Cadet and also medaled in eighth place in Juniors. Magda renewed her A2019 and Siobhan her B2019. Meanwhile, in the mens’ competition, Brandon (6th) and Sean (7th) both medaled in Cadet. Iain finished tied for 18th in men’s junior. Congratulations to all the OFA competitors at the SJCC. It was a great showing by our club. Congratulations to Kelly Dewsnup and Alfred Lara for their strong performances at the recent Seattle International Veteran’s Cup. Dewsnup won Gold in the women’s competition, and Lara took Silver in the men’s side. Great work by OFA’s veteran fencers! Magda and Siobhan were the class of the Y14 girls’ field at the March NAC in Cleveland, with Magda claiming gold and her A2019 rating after following up a thrilling 15-14 contest with Siobhan in the semifinals with a decisive 15-8 victory in the finals. Sophia C. finished 33rd in the Y14 competition. Magda also delivered an incredible anchor leg in the Y14 team event that led the OFA girls to Gold. Y12 girls: Keona (42), Sophia P. (46). Division III women: Byronie (39), Shengyao (55). Y10 boys: Alexander (14), Maks (38), Mukul (49). Y12 boys: Vasil (13), Hyder (66), Maks (83), Alexander (114). Oregon Fencing Alliance again will be partnering with Park and Recreation Districts and local schools to offer Learn to Fence camps through the Greater Portland area this spring and summer. Many of our best fencers started with these camps! The following is a list of offered camps. Contact the rec districts and schools themselves for registration. Brandon Chang swept two events at the Feb. 23 Progressive, the first of four Oregon Fencing Alliance events this spring, winning Y14 and the Open competition. Brandon was also third in the Cadet competition. Vasil Atanassov won the Y12 event and was second in Y14. Maks Skarbonkiewicz won Y10, and his sister, Magda, took the Cadet category. OFA Progressives are fun and fully sanctioned events open to all fencers, not just members of OFA. Many fencers come from other clubs to participate. Registration and start times are available at askfred.net. We strongly encourage fencers to register in advance, although entries are also accepted on the day of competition at the door. Loaner equipment is available. Our next three Progressives will be held April 6, May 18 and June 8. Join us! OFA’s girls made a strong showing at the 2019 Junior Olympics in Denver, with Anna Li earning a fifth place medal in Cadet and earning her A2019, while Magda Skarbonkiewicz fenced well beyond her years in Junior, earning top 16. 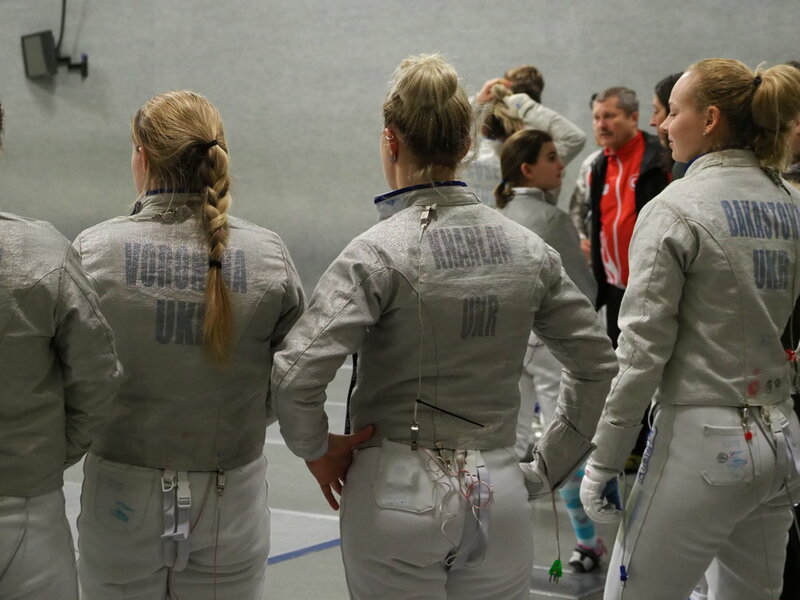 Magda led seven OFA fencers into the top 64 in Juniors, followed by Nina Hunter (29), Anna Li (31), Neve Harrison (40), Siobhan Sullivan (44), Vivian Lu (50) and Zoe Turner (58). Five other OFA fencers joined Anna Li among the top 64 in Cadet, with Neve and Vivian tying for 22, Nina 26, Siobhan 43 and Sophia Cheema 61. The boys had a tougher go of it, with only Brandon Chang (46) making the top 64 in Juniors. In Cadet, Sean Kim was 31, Peter Barnett 51 and Brandon 60th. Congratulations to all of our fencers for their dedication to hard work and discipline and thank you to coaches and parents for your support. Good luck to nearly two dozen OFA fencers who will be competing at the 2019 Junior Olympics in Denver this weekend. 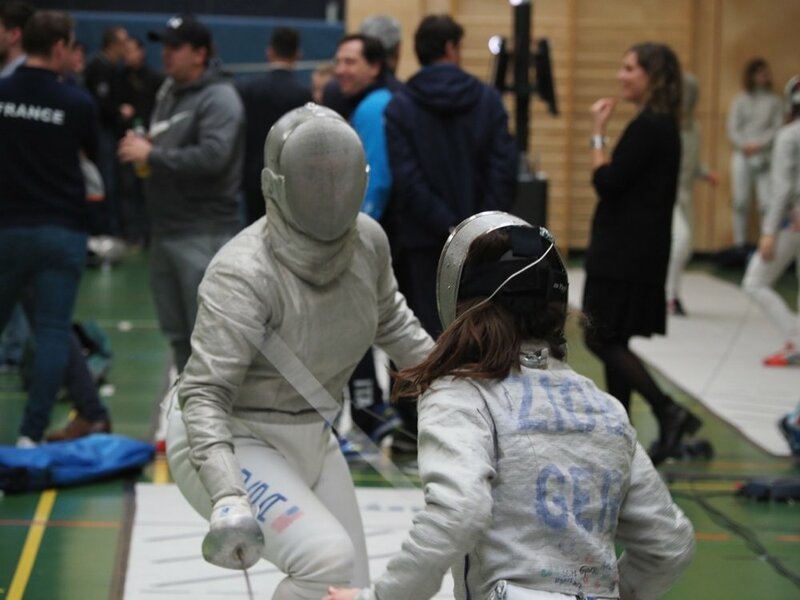 OFA is fielding teams in both the Junior Women and Men team events as well as having a number of highly seeded fencers in both genders in Cadet and Junior individual competitions. Read all their tips here. The way that fencers learn the sport is totally different than most other sports. Fencers learn in a two-pronged way – group classes and private lessons. Group lessons offer fencers the chance to learn alongside other fencers and to practice on the strip with athletes of a similar skill level. Group fencing classes are guided closely by coaches. Private lessons on other side is 1-on-1 instruction session with a fencing coach. In a private lesson the coach teaches different elements of technique per individual needs of a fencer and based on their skill level. Private lessons are essential part of fencing education and you cannot skip it for a long if you want to make a real progress. Think about it this way – a few hundred years ago you trusted your sword to defend your life. Would you be confident in your skills to protect yourself without getting private lessons with a fencing master and then practicing with your opponents in a training session? It’s a model that works. The U.S. women’s sabre team that finished fifth in the strongly contested team event at the Women’s Sabre World Cup featured three Oregon Fencing Alliance fencers, Mariel Zagunis, Ola Shelton and Chloe Fox-Gitomer. The U.S. women’s team was defeated by Italy in the Round of Eight, but came back to oust Russia and Korea and claim the fifth spot in the competition. Down 40-33 to the Russians, Zagunis delivered an incredible anchor leg, outpointing Sofia Pozdiakova 12-3 to lead the USA comeback victory. In the individual competition, Shelton finished 25th, Zagunis 41st and Fox-Gitomer 5oth. Three-time World Champion Olga Kharlan was among the fencers at the OFA Progressive. JAN. 19, 2019—The fourth and final OFA Progressive of the Fall/Winter of 2018-19 will go down as one of the most memorable in-house events in the club’s history. The Ukrainian, Turkish and Argentine fencers who spent the past week at OFA training and tuning up for next weekend’s Senior World Cup in Salt Lake City all took part in the Progressive. 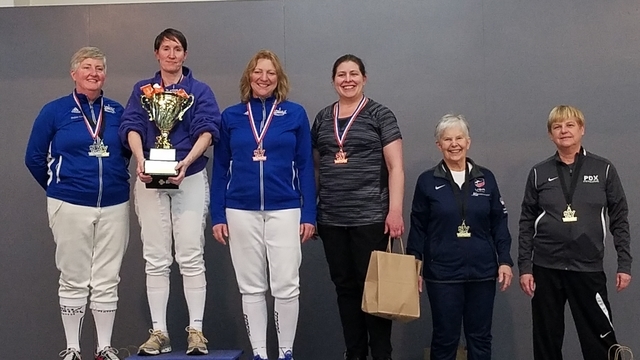 The 38-person field for the Open event included a number of the top women fencers in the world, including OFA’s own Mariel Zagunis, a two-time Olympic champion and the most decorated U.S. fencer, and Olga Kharlan, a three-time Olympic medalist. OFA’s Max Parson-Scherban won the Open event. Congratulations, Max, on an unforgettable day. In the other events, Maksymilian Skarbonkiewicz won the mixed Y10 event, Vasil Atanassov was a double-winner, taking the Y12 and Y14 mixed events, and Will Attig took the mixed cadet. 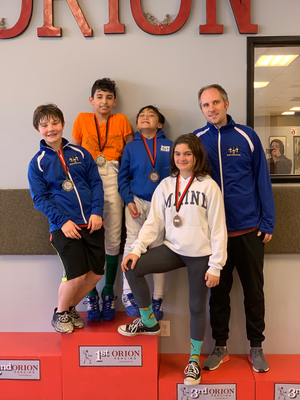 More than a dozen current and former OFA fencers competed in the Division I and Junior competitions at the January North American Cup in Charlotte, N.C., taking home two medals and claiming a number of top 50 finishes. Chloe won gold in Junior women and finished fifth in Division I. Ola took bronze in Division I. Six OFA fencers finished in the top 50 in a large field of Juniors, including Zoe (27th), Neve (34th), Vivian (39), Nina (46), and Anna (50th). On the men’s side, Ben finished 40th in Juniors and Will was 51st. The next major national competition is Junior Olympics in February. See you there! Neve won Gold in team and finished 27th among individuals at Eislingen. 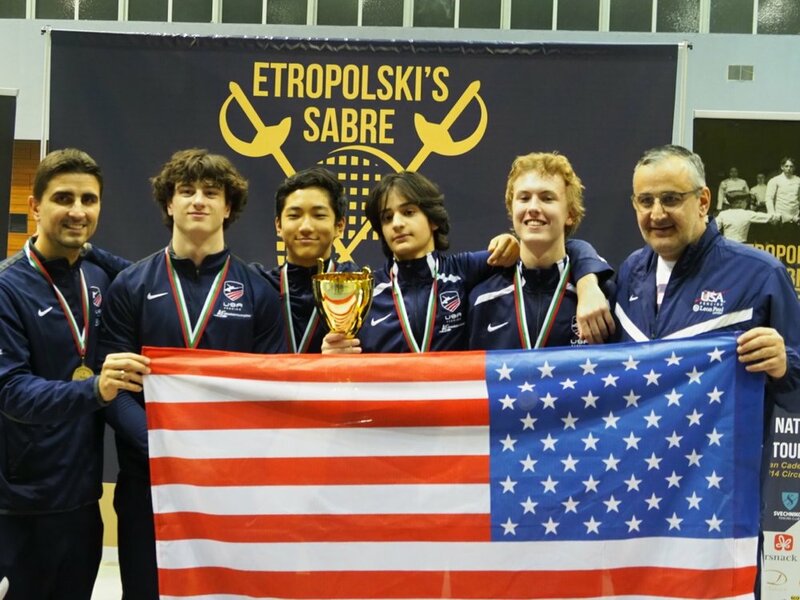 Neve and Will helped their USA teams to Gold and Silver, respectively, in the team competitions in the European Fencing Confederation, Cadet Circuit European Cup last weekend in Eislingen, Germany. OFA sent five of the 40 U.S. boys and girls to the tough European competition, more than any other individual U.S. club. Coach Adam was there to lead the OFA group. Vivien (19th) and Neve (27th) came. home with individual points. Nina finished 71st out of more than 200 competitors. On the boys’ side, Will finished 56th and Iain came in 138th in a strong field of more than 220 fencers from a dozen nations. OFA fencers made a great showing over the weekend at the Salle Auriol Seattle RJCC. Siobhan won Gold in cadet women. Makana took Bronze in that event. Zhiyin was 7th, Shengyao ninth and Byronie 12th. In cadet men, Artyom and Dante took Bronze, Mukund was fifth and Gavin eighth. David Fang won Silver in men’s junior, while Artyom was sixth, Dante 8th and Gavin 10th. In women’s junior, Makana won Silver and Zhiyin was fifth. RESULTS! Rain City RYC, November 17-18, 2018. Bellevue, WA. Medalists and top finishers are below. Congratulations to all on your accomplishments, hard work and dedication. Y10XS: Alexander P, GOLD; Jia B, BRONZE. Y12WS: Keona B, GOLD; Sophia S, SILVER. Y14WS: Siobhan S, GOLD; Sophia C, SILVER; Keona B, BRONZE. RESULTS! Etropolski's Sabre. Sofia Cadet Circuit European Cup. November 17-18, 2018, Sofia, Bulgaria. Despite travel delays due to weather on the East Coast, nearly all American fencers made it to the competition. Here are individual and team results of OFA fencers. CMS: Will A, 71; Iain D, 85. CTmMS: USA 1 (Will A), GOLD; USA 4 (Iain D), 45. CTmWS: USA 2 (Neve H), SILVER; USA 3 (Vivian L), 12. Congratulations to all our fencers.